Here is a d100 table of Psyker powers as part of the d1000 inquisitor attributes project. Go back and read that post if you want to know what this is about. I apparently have not finished off this project, with no posts in the last... year and a half. hmm. In any case, I am slightly more invigorated for this project, and hope to wrap it up soon(ish). These suggestive power names have been drawn from a variety of official and unofficial sources, and have been sorted into categories based on the most likely school of Psyker powers from which the power is drawn. Players are of course free to rationalize where the power comes from. 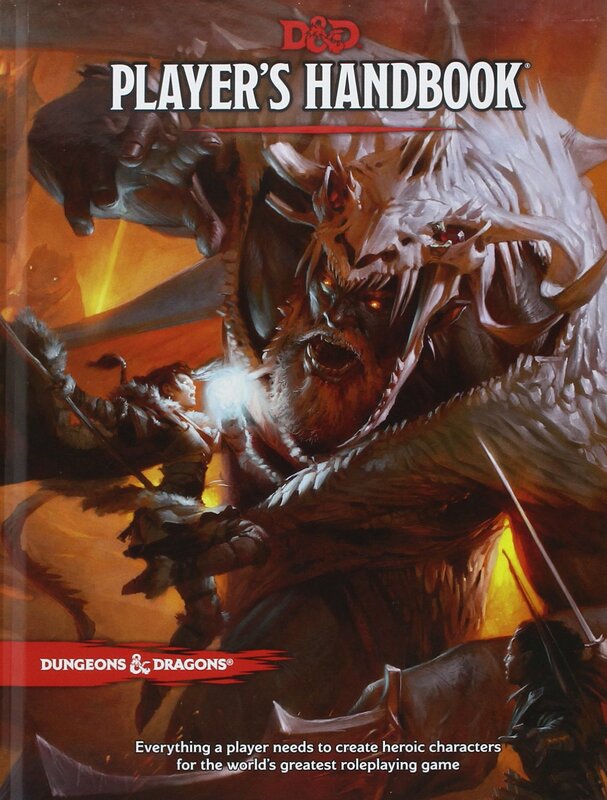 I spent some time today going through the 5th edition players guide, translating my Pathfinder character to the current version D&D for a hoped for continuation of our campaign on Roll20. Lots of fun to figure it all out. Why did I pick to play a multi classed character again? GW has a booth at the Nuremberg Toy fair this year, and are pitching build/paint kits to hobby/toy stores. Could be a good way to get some of these older or press part kits circulating again, and certainly seems like something that someone like my nephew might appreciate. In other news, I have been a bit under the weather due to the recent removal of a minor organ coupled with a cold, a combination that does not bode well for energy. 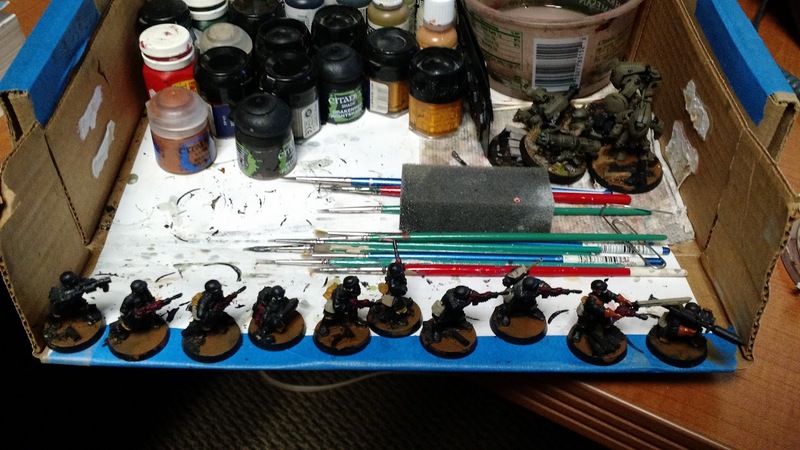 I did manage to get some work done on the 62 bases of the Steel Legion, which ultimately does not look like much, because again, there are 62 of them so it is sort of swallowed up. As readers of this blog will no doubt recall, I have been working on Imperial Guard and Tau for an eventual skirmish game. Not content to have two unfinished projects, I thought it was time to make steps at starting another. Eldar are a classic 40k race, and can be made to be infantry heavy, which is desirable for this project. I have often admired the early "banana head" look of Alaitoc eldar (blue suit, yellow head), and desire to replicate that for this project. I will be using some vintage metals, some more recent metals, and plastics, all mixed together in a hopefully harmonious way. Given the notorious difficulties of painting yellow, I thought it best to test out the base color, so as to avoid headache later. 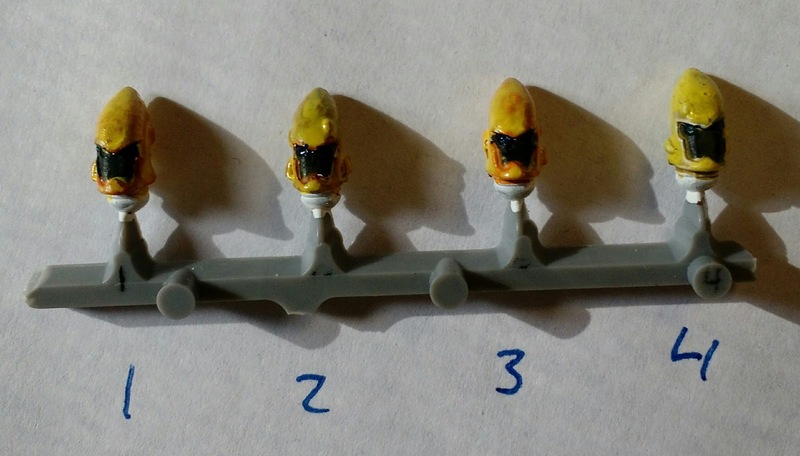 I primed these test heads with white gesso, painted the face plates black, and then painted each one with a different first coat, before overlaying with Vallejo Deep yellow (70.915). I actually like the look of all of them, which is good, but does not make the choice of undercoat easier. So dear readers, which do you like better? 1, 2, 3, or 4? I suppose there is a sort of tradition in blogging to do a round up of the past year, and give some goals and predictions for the new year. As it happens, in 2016 I expect to carry on with unfinished projects, which is to say all of them, while resisting the urge to start new projects. As always, contact with the enemy (time) will change the plan. It does, however, augur well for the year that I have already played (and won) a few board games. What about you? What does 2016 hold? 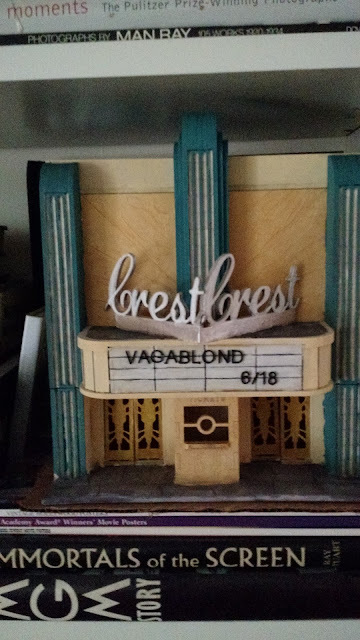 As you no doubt read in part one, two, three, and four, I ordered the Monarch Theater from Multiverse to build as a gift for my wife. Now we are coming into the final stretch, the time right before Christmas where I panic and cut down on sleep in order to get this thing finished. With various family commitments and events, I estimate that I have only a few hours of time before Christmas arrives, so this is going to come down to the wire. (as always). As it happens, this year I have a cold, and it will be very hard to squeeze out any more energy, so we will see if I can finish or not. No painting pictures from this one, but I do have one of the nearly complete theater in its eventual place. When I was putting it together for this test, I realized that the leading stroke of the "C" was touching the wall in such a way as to prevent the marquee from seating correctly, so I will have to shave that down. Still to come: weathering for the building, interior work, and the inevitable touch ups.